When I had the chance to highlight some gift ideas for Sonoran Living last week, I wasn't able to talk very long about each gift and some I wasn't able to mention at all. One of the gift bags that I wanted to talk about was the one put together for me from Whole Foods Markets. I love their reusable bags. They are extremely sturdy and come in a variety of sizes. I actually have 2 of these bags and use them often for small purchases. I have also used them as gift bags, since they are such a convenient size! This bag was full of extremely useful things for a mom. A tub of Hugo Naturals Dead Sea Salt Scrub was the first thing I had to open up and sniff. I love the smell of lavender and this has a wonderful scent. The scrub isn't harsh at all, but left my skin silky smooth with a lingering scent of lavender. A tin of "Get Relaxed" tea from The Republic of Tea has a touch of lavender in it as well. This was a lovely tea to end my day with after a long day in front of a packed class of students learning about the advanced features of Excel. At first, I wasn't sure what to think of the Kate's Magick Aura Mist. The scent I received was "Heart & Spirit" It was labeled as helping "to open the heart to love, compassion and healing." I find myself spraying it in the office as I work, and even spraying it on myself as I head out the door. I like the scent, which isn't at all flowery or perfumery -- but it is relaxing and calming. I like the fact it is made locally here in Arizona. I love handmade soaps, but don't often indulge. I didn't know that Whole Foods Markets in Tempe offered the chance to slice off chunks of some deliciously aromatic soaps. I liked the scents of the ones they gave me, but when shopping there today I noticed that the soaps are completely free of glycerin. Glycerin is one of the things my sister is allergic to, so I'm always on the lookout for beauty products that are glycerin-free. They are made with oils, goat milk and essential oils. As long as she avoids the essential oils she is allergic to, these are great soaps for her, too! And, finally, in the bag was a bottle of Whole Foods Women's Food Based Multi-Vitamins. While pregnant and nursing, I was good about watching my food and supplementing with vitamins, but I have not been as careful in the last year. This was a great reminder to me to take better care of myself and I have begun taking the vitamins. 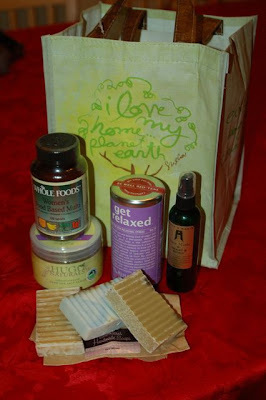 I think they put together an absolutely wonderful gift bag for Mother's Day and am grateful for the chance to indulge in these great products. If you're looking for a Mother's Day gift, I highly recommend checking out the local Whole Foods Markets and seeing what they offer! Later this week, I will write about the tour of Whole Foods and their many allergy-free products! We've had company in town, but I'm hoping to get it on the blog soon. Disclosure: I received products for review, but no additional compensation for this post. truly enjoyed your blog...will be a regular reader! I noted that you mentioned that your son went to a speech therapist...I have a little one that (I believe) needs to be evaluated, can you or would you consider giving me any advice or the name of the one you see? I have tried in the last two months to find one through the state programs but have not had any luck. I have never had the opportunity to try them, but this little gift if given to me, I would love it. Thanks for sharing.